As cars slow down to go over the bump, the weight of the car causes a chain reaction inside the device, which creates 2,000 watts of electricity. A fast food drive-thru lane might end up helping make the world a greener place, if not exactly skinnier. As customers pull up to the pickup window at a Hillside, NJ Burger King, they'll drive over a device that looks suspiciously like a speed bump. Except it's an energy-creating device. As cars slow down to go over the bump, the weight of the car presses down on long pedals across the top of the bump, which turns the gears inside and creates 2,000 watts of electricity. 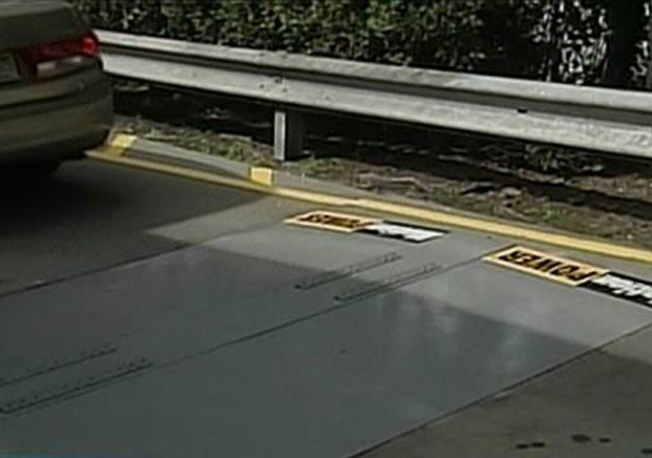 Since drivers need to slow down anyway, the "Motion Power Energy Harvester" captures the kinetic energy that would normally be lost when a person stops at the pickup window -- i.e., no one's making money off of you when you go through the drive-thru. The power the device creates is enough to fuel a typical hair dryer -- but only for a second, according to Gerard J. Lynch, the president of the Springfield, Md., company that created the device. Sigma Design is testing its MotionPower technology in Hillside for a week. Its next stops include the Four Seasons in Washington, D.C. and the Holiday Inn Express in Baltimore.